Heuristics: the student-researcher studies the prayer’s literary composition, and liturgical and historical context. Hermaneutics: the student-scholar interprets the prayer in its liturgical-ritual context and according to four pairs of interpretative keys. Synthetics: the student-author formulates an argument that addresses the concerns of an identified audience and presents the prayer twice in the seminar and in a written summative paper. In this seminar, the student joins the collegial discussion among scholar-participants, as the professor provides careful supervision of the work undertaken. Heuristics: the student will have gathered essential information on a prayer, its Latin expression, liturgical context, uses in history, sources. Hermeneutics: the student will have interpreted the prayer both in its liturgical context and according to four pairs of interpretative keys: anamnesis (narration – ritual programme); presentation – epiclesis; eschatology – moral life and personal maturation; theosis – a personal way of being in freedom and love. Synthetics: the student will have integrated the findings and interpretation into a reasoned argument intended to address the concerns of an identified audience, and will have communicated this in oral form to the participants in the seminar and in written form in a final paper. The student conducts personal research while engaged in collaborative conversation with colleague-scholars, as the professor provides careful supervision of the work undertaken. In seminar the professor reviews methods of finding data, interpreting a prayer in context and writing a summative paper; in and out of seminar the professor provides careful supervision. Each student presents the Latin text of the prayer, its sources and historical contexts to the seminar. In a second presentation each student interprets the meaning of the prayer in its liturgical-ritual context according to the four pairs of interpretative keys. Seminar discussions encourage learning from others and support self-motivated personal research and sharing personal reflections. Each student integrates this historical and hermeneutical method and findings in the preparation of a reasoned argument on the Latin text of a prayer intended to address the concerns of an identified audience. Each study begins with a clear and accurate understanding of the Latin text of the prayer. The student-researcher seeks to identify sources of the prayer in Scripture, literature, magisterium. The student-researcher traces the history of the use of the prayer in its liturgical contexts. The student-scholar interprets the meaning of the prayer in its liturgical-ritual context and according to four pairs of interpretative keys. The student-author addresses the particular concerns of an identified audience in two oral presentations on the prayer and in the final written paper. Please do not phone the instructor. Rather email him at danielmccarthyosb AT mac DOT com. He is available outside of class time by appointment. ♦ Leachman, J.G. – McCarthy, D.P., « The formation of the Ecclesial Person through Baptismal Preparation and celebrations of the RCIA: The Collects of the Scrutinies », The Liturgical Subject: Subject and Subjectivity, ed. J. Leachman, SCM–University of Notre Dame Press, London – Notre Dame, IL 2008, 172-200. ♦ Leachman, J.G. –McCarthy, D.P., « Preparation for the Piazza: The Preface of the Second Scrutiny (the Fourth Sunday in Lent): the mystagogical formation of the neophytes and the assembly, » Conference of Societas Liturgica, « Liturgy and the Piazza », Studia Liturgica 38 (2008) 114-33. ♦ Leachman, J.G., “The Role of the Holy Spirit in the Catechumenal Preparation for Baptism in OICA,” in Spíritus spiritália nóbis dóna poténter infúndit, [Studia Anselmiana 139], PIL, Roma 2006, 277-292. ♦ Leachman, J.G., “The Holy Spirit in the Period of Purification and Enlightenment in RCIA,” Studia Liturgica 36 (2006) 185-2007. ♦ Transition in the Easter Vigil: Becoming Christians. Paschali in vigilia Christiani nominis fieri, ed. D.P. McCarthy – J.G. Leachman (Documenta rerum ecclesiasticarum instaurata, Liturgiam aestimare: Appreciating the Liturgy 2), St. Michael’s Abbey Press, Farnborough 2011, 295-322. ♦ Corpus orationum, 14 vol., ed. E. Moeller – J.-M. Clément – B.C. ’t Wallant (Corpus christianorum series latina 160-160 M), Brepols, Turnhout 1992-2004 (CO)..
♦ BRUYLANTS, P., Les oraisons du Missel Romain, texte et histoire (Études liturgiques 2 vol. ), Mont César, Louvain 1952. ♦ DESHUSSES, J., – B. DARRAGON,Concordances et Tableaux pour l’étude des grands Sacramentaires, 6 vol., Editions Universitaires, Fribourg 1982-83. ♦ GAMBER, K., Codices Liturgici Latini Antiquiores, I-II, Fribourg-en-Suisse, 21968/88 (CLLA). ♦ Appreciating the Collect: An Irenic Methodology, ed. J.G. Leachman – D.P. McCarthy (Documenta rerum ecclesiasticarum instaurata, Liturgiam aestimare: Appreciating the Liturgy 1), St. Michael’s Abbey Press, Farnborough 2008. ♦ MCCARTHY, D., “Seeing a Reflection, Considering Appearances: The History, Theology and Literary Composition of the Missale Romanum at a Time of Vernacular Reflection”, Questions Liturgiques / Studies in Liturgy 94 (2013) 109-143. ♦ VOGEL, C., Medieval Liturgy: An Introduction to the Sources, tr., rev. W.G. Storey – N.K. Rasmussen (National Association of Pastoral Musicians Studies in Church Music and Liturgy), Pastoral Press, Washington D.C. 1986, (of Introduction aux sources de l’histoire du culte chrétien au moyen âge, Centro italiano di studi sull’alto medioevo, Spoleto 1981). ♦ LEWIS, C.T.,- SHORT, C., A Latin Dictionary, OUP, Oxford-New York 1879, reprinted 1995. ♦ FOSTER, R. – D.P. MCCARTHY, Ossa Latinitatis Sola ad mentem Reginaldi rationemque: The mere bones of Latin according to the thought and system of Reginald (Latinitatis Corpus 1), Catholic University of America Press, Washington DC 2016. Enter an inflected form of your word in the field under the heading “Dictionary Entry Lookup”, located in the column on the right. ♦ LEWIS and SHORT dictionary available here: Enter the dictionary entry for your word in the field under the heading “Dictionary Entry Lookup”, located in the column on the right. ♦ LEWIS and SHORT entry word search: This is another version of the above entry word search. This one is well laid-out for easier reading. Enter the dictionary entry for your word in the field at the top left of the page. ♦ GILDERSLEEVE, B.L, – G. LODGE, Gildersleeve’s Latin Grammar, Bolchazy-Carducci, Wauconda IL 2003, reprint of 31895 (GL). 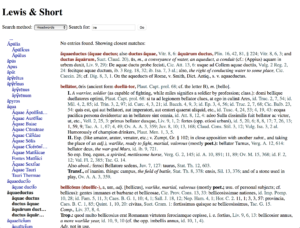 Even more Latin dictionaries are available on Logeion, including Lewis and Short. Enter the dictionary entry for your word in the field at the top of this page. If the search produces entries from several different dictionaries, they are listed first and you can choose which one you wish to consult. Having agreed with the instructor upon a Latin prayer from the OICA, the student conducts his or her own study of the prayer and presents the findings in two seminar presentations. The student also participates in the seminar discussion on the research of other collegue-participants. The student uses the shared discussion and personal research to revise and further develop a final paper. Explanation: The student presents his or her findings in class twice and has the chance to revise the material based on class discussion and feedback from the instructor, before submitting a research paper of 10 pages of text but not more than 15 pages, following the norms of the PIL (without binding). The norms of the PIL may be downloaded here. Mode of evaluation: The final assessment will be based 50% on class participation and 50% on the final written paper. When: The final paper is to be handed in to the Registrar no later than (Thursday, 15 November 2018) Wednesday, 5 December 2018, two copies if the student would like to receive back a copy with notations and comments. The program of studies with course descriptions and calendar for the academic year 2018-2019 is available for download here. The purpose of a seminar is for the participants each to conduct his or her own research and to share the results with the others in a collective learning environment. Since the students are expected to work together, we shall begin with general introductions of the students to one another. We shall go over the syllabus and bibliography. We shall assess the goals of the seminar. We shall establish the days and times of our encounters. The students are requested to choose the prayer they wish to examine and next to prepare a direct translation into English (or Italian) as well as into their mother language. The moderator will present two pages, one showing the historical development of the early Roman sacramentaries and the other showing the family of eighth century gelasian sacramentaries. The moderator will discuss how to read these charts and how to trace the appearances of a particular prayer in the sacramentaries indicated on the charts. Both of these charts are found in, C. VOGEL, Medieval Liturgy: An Introduction to the Sources, on pages 400 and 402. The seminar will then move to the library where the moderator will present these instruments to the seminar participants who will then have the opportunity to research their own prayers using the instruments. The first encounter will end as the participants continue to follow their own research into the sources of their own prayers. In preparation for the second encounter, each participant is requested to prepare a translation of his or her own prayer into English and into the author’s own mother tongue. To prepare this translation, the participant is requested to follow the series of questions found on this web-page under the heading “Encounter 1”. Participants who are familiar with the process may also prepare the semiotic analysis of their own prayer answering the questions, “Who does it?”, “Who does what?”, “Who does what to whom” in three separate charts, as presented on the same web-page under the heading “Encounter 3a”. In preparation for presenting these findings to the other participants in the seminar, each participant is requested to write out his or her analysis of the Latin text and leave it for me with the porter in the portineria or with the Registrar in the Segreteria by Monday, 8 October at 10:00 in the morning. During Monday morning I’ll examine these carefully and peacefully. I’ll return these prayers to the Registrar’s office and put each paper in the box corresponding to the student’s surname so that each author may consider my comments before we meet for the next encounter. Please indicate your surname on the page. Participants are then requested to revise their analysis of the Latin text of the prayer and prepare copies for each of the participants in the seminar so that we may consider each prayer all together (currently there are 5 participants plus the moderator = 6 copies). et inter Ecclesiæ tuæ membra numerentur. huius sacrificii tribuas operatione mundari. You may download the list of prayers here, print them and bring them to class with you so that you will have the text of any prayer we may consider. During our second encounter each participant will present the analysis of the Latin text of his or her prayer for as long at time permits. This is to include an initial English rendering of the prayer along with a rendering of the prayer into the author’s mother tongue. Each participant will lead the seminar in understanding the Latin expression his or her chosen prayer. Sushil will begin to present his findings on the source of his prayer. The purpose of these presentations is not to present final conclusions, that will be done in the final paper. Rather each participant is to present the state of his or her ongoing research and analysis and to invite discussion on their findings and method as they progress in their research. If we get done in time, then we shall discuss any difficulties participants are having in finding the sources for their own prayers. Depending on how far we progress during the time allowed, we shall either continue with the analysis of the Latin text during encounter three before we shall move on to presenting the sources of the prayer in the early sacramentaries. If any student did not have a chance to present their analysis of the Latin text of his or her prayer during the second encounter, then he or she does so now. Once the analysis of the Latin text of each prayer is complete, we shall move on to presentations of the appearance of the prayers in the early sacramentaries and ordines. The primary liturgical sources include the Gelasianum vetus, Paduense, Tridentinum, Hadrianum, and from the eighth-century gelasian sacramentaries taken more or less together, the Gellonensis, Augustodunensis (Phillips), Angoulesmensis; the Missalia Romana from 1570 and following, including 1962, 1970, 1975, 2002, 2008. Some prayers may also be found in the Ordines Romani, Romano-Germanicum Pontificum c. 950, and in later Pontificalia. Each participant is to assemble the relevant information about his or her prayer for the presentation and to have copies of all the information on hand for the discussion that follows. Bring a copy of your prayer from the current OICA, along with a copy of the context of your prayer, that is the rite it which your prayer is found, along with a copy of the introduction to that rite with particular focus on the place your prayer has in its rite. This will help you to understand the prayer in its context. Bring a copy of the entry for your prayer in the Corpus orationum. If your prayer is not included in the CO, then bring a copy of the relevant entries in Deshusses – Daragon. Also consult Bruylants for any later information about your prayer. Please include all of the critical apparatus and the list of relevant abbreviations for the liturgical books mentioned in the critical apparatus. Bring a copy of your prayer in the primary liturgical sources, along with its context in each source. One prayer is found only in the Mozarabic sacramentary of Toledo; bring a copy of that prayer along with its context. When you make copies, always copy also the title page and copright page of the book so that you will have that information with you as you write your paper. The following list may help you to consider your prayer in its context in each of the primary liturgical books. Describe the type of liturgical book, who used the book for what type of liturgy in what pastoral context. Give the date of its oldest or its primary manuscript and the presumed date of its original composition. Describe where the book was first developed and how the oldest or the primary manuscript is currently preserved. Describe whether the manuscript is a pure form or if it has been revised in the process of transmission to its current state. Describe how the book is organised, how the temporal and sanctoral cycles are incorporated into the whole volume. Mention any appendices the extant volume has. Describe how the rites of Christian initiation are incorporated into the whole volume, with particular reference to the rites which include your prayer. Describe the part of the rites of Christian initiation which includes your prayer and how that part is organised. Give the Latin heading and describe how the material is organised. Give any rubrics associated with your prayer and any alternative prayers. Present the textual variants of the prayer in its successive appearances. One primary goal of this process is to trace the use of your prayer on the two charts from Vogel given to you in the first encounter. On these charts indicate the presence of your prayer in each sacramentary by writing the number of your prayer next to the heading for each book. From this you can trace the appearances of your prayer in the early liturgical books and you can describe the context of your prayer in each of the liturgical sources. Participants will begin to present their findings during this our third encounter. Depending on how long these presentations take, we may well need to extend the presentations into the fourth encounter. We shall begin this encounter with any further presentations on the prayers in their contexts. I imagine the presentations may require this entire encounter. At the conclusion of these presentations we shall assess our progress and decide on the final elements necessary to conclude the seminar. We could use our last two sessions for students to present their papers to the others. This would allow us to focus on the mechanics of writing a seminar paper. Some participants may wish for the moderator to show them how to use the Library of Latin Texts to search for citations in the prayer from christian literature or for allusions to literature. Since many of the participants have already taken one of my courses on either the collects or prefaces, some participants may now want to incorporate some reflection on these interpretative keys into their final presentation of their paper. The prayers available for your consideration include the following. I’ll put the name of each student after the prayer chosen. 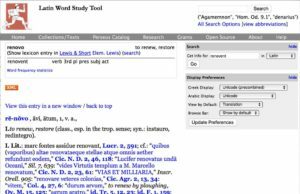 I have begun to develop a page of resources for the Latin language including: dictionaries, grammars, resources, texts, links.